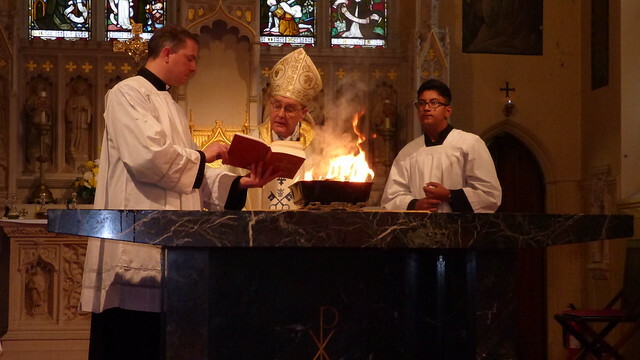 The Altar at St Mary's Church in Great Yarmouth has been re-dedicated by Bishop Alan Hopes after it was desecrated during an arson attack in March, and the church was also blessed. During the re-dedication Mass on May 31, Bishop Alan asked for prayers for the young man who desecrated the altar. The Bishop urged everyone to attend for a few minutes of private prayer in the next week or so to experience the smell of the holy oil and the incense used in the Mass. Fr Anthony thanked Bishop Alan for attending and conducting a beautiful Mass. He also thanked everyone for their support both in the immediate aftermath and ongoing since the incident. Fr Alex from St Peter’s, Gorleston, also concelebrated at the Mass. Pictured above is Bishop Alan Hopes during the re-dedication Mass at the Altar at St Mary's church in Great Yarmouth. Pictures by Brian Lafferty. See below or click here to see a full picture gallery of the re-dedication.